Indigenous leaders, senators have asked the government to postpone the plan. Prime Minister Justin Trudeau speaks during the Assembly of First Nations, Special Chiefs Assembly in Gatineau, Quebec on May 2, 2018. OTTAWA — Prime Minister Justin Trudeau isn't backing down from his government's much-maligned timeline for legalizing marijuana, despite a growing chorus of calls from senators, Indigenous leaders and others to delay the plan for up to a year. Trudeau says the plan to make recreational pot legal by this summer will go ahead without delay. "We're going to continue to move forward. We're going to bring in legalization as we've committed to this summer on schedule," Trudeau said Thursday. That declaration followed comments the previous day that suggested he was open to slowing down the process, following a Senate committee report calling for more consultation with First Nations on taxation, education materials and addictions treatment. 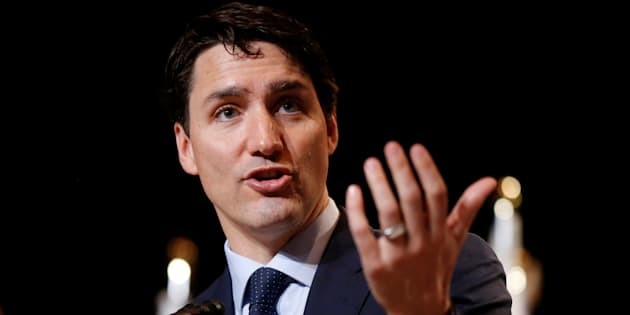 Every single day that marijuana remains illegal, Canadians are being harmed, proving that the current approach is not working, Trudeau said, predicting that legalization would take control away from criminal organizations and drug dealers. "Right now young people have far too easy access in Canada to marijuana. Criminal organizations make billions of dollars a year in profits on the sale of marijuana," Trudeau said. "We need to move forward on a system that controls and regulates while protecting our kids and our communities." Legalization is a process, not an event, he repeated — one that will involve continued work with provinces, municipalities and Indigenous leaders to ensure the law is rolled out properly. But some provinces have raised concerns about the legalization plans, particularly as they will apply to home cultivation of marijuana. The federal pot bill, Bill C-45, would make it legal for Canadians to grow up to four cannabis plants at home, with provinces and territories having the latitude to impose their own limits. Manitoba and Quebec say they will forbid home cultivation of any kind; a second Senate report this week recommended a similar outright ban. Trudeau said the federal government's decisions on such elements of the bill were developed after years of consultations with experts looking at the most effective ways to cut criminal elements out of the sale of marijuana. "The decision on home cultivation of up to four plants was based on logic and evidence and it's one that we will continue to establish as part of the federal framework," he said. "Make no mistake. This is a public health and public safety issue that we committed to in the election campaign and that we will be moving forward with this summer." But don't expect to see any other street drugs legalized anytime soon. Trudeau met Thursday in Ottawa with Portuguese Prime Minister Antonio Costa, who told their joint news conference about his country's decision in 2000 to decriminalize illicit drugs, and how that has helped to mitigate their addiction problems. Portugal now treats drug users as individuals who need care, rather than as criminals, Costa said — a measure that involved bolstering the country's health care system to offer treatment alternatives, rather than jail time, and which has earned plaudits from the United Nations. Costa also made a point of noting the difference between decriminalization and outright legalization. Some backbench Liberal MPs have been pushing for Canada to adopt a similar approach as a way to deal with the ongoing opioid crisis. But Trudeau said while he he is always interested in looking at the successes of other countries, his government has absolutely no intention of legalizing any more illicit drugs.